Radiation Therapy is a precise treatment plan that uses radiation to accurately target cancer cells. 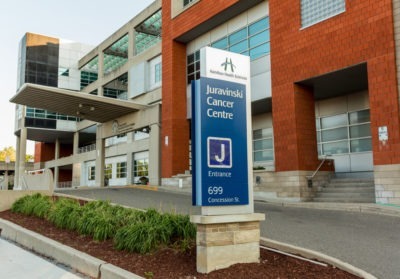 The Juravinski Cancer Centre houses a large radiation treatment program with a team of radiation oncologists (physicians), radiation therapists, medical physicists, nurses, and a number of support staff. Radiation therapy uses high-energy radiation to kill or damage malignant tumour cells. Normal cells are able to recover from radiation damage better than cancer cells. External radiation therapy treatment is given from outside your body from a machine (linear accelerator) that delivers radiation. Internal radiation therapy places radioactive sources into the tumour inside your body or as close as possible, this is called “brachytherapy”. Patients don’t see or feel radiation and are not “radioactive” following treatment. In most cases, the same amount of radiation will be given each day throughout the course of the treatment plan. After treatment, patients can usually continue with normal activities although they may tire more easily. Radiation passes through healthy tissue while treating the tumour. Therefore, normal cells can be damaged, which causes side effects. In general, the side effects of radiation therapy are contained to the area of treatment and are well managed. Most patients will experience some side effects after receiving radiation therapy. A support team (radiation therapist, oncologist, nurse, nutritionist, and counsellor) are available to help patients manage these side effects. We also have a Supportive Care Department for help with nutrition, emotional, financial and practical support. Brachytherapy is a type of radiation therapy in which a very small and intense radioactive sealed source is placed near or in the tumor. High dose rate (HDR) brachytherapy, also called internal radiation therapy, allows using a higher total dose to treat a smaller area in a shorter time than is possible with external beam radiation treatment. It is very precise and prevents the nearby normal tissue from being affected by the radiation. Depending on where the cancer is in the body, the radioactive source placement is either permanent or temporary. Permanent. This involves placing low-dose radioactive seeds or pellets implants in the tumor and leaving them there. After several months, the radioactivity level of the implants reduces to a negligible amount. Temporary. A high radioactive source is placed inside a catheter or slender tube for a set amount of time, and then removed. Temporary brachytherapy uses a high dose rate unit. Patients go home after the treatment – there is no overnight hospital stay. How does HDR Brachytherapy work? High dose rate (HDR) brachytherapy involves the remote placement of the radiation source. The delivery of brachytherapy treatment is very quick; the actual radiation treatment takes a few minutes. The source returns into the machine so that no radioactive material remains in the patient’s body. The treatment may be repeated several times in a day or a number of times over one or two weeks. The treatment is controlled from outside the treatment room. Patients are constantly watched as the radiation is delivered. Patients can go home shortly after treatment. Who is involved in the procedure? Radiation Oncologist: The radiation oncologist is a doctor who decides how the radiation is given, the amount of radiation and how much radiation the nearby tissue can tolerate. Medical Physicist: The physicist together with the radiation therapist are designing the detailed treatment plan. Radiation Therapists: The radiation therapists are responsible for the accurate delivery of the treatments and monitor the patient to ensure patient safety at all times. Radiation Therapy Nurses: The radiation therapy nurses provide the sedation and carefully monitor the patient before, during and after brachytherapy treatment. Patients are given conscious sedation medications through a vein (IV) to help them relax. What are the benefits of HDR Brachytherapy? HDR Brachytherapy is very effective in treating localized cancer, meaning a tumor that is located in just one area. The radiation can target the tumor and is very precise. There is no major damage to the nearby healthy tissue and very little risk of side effects. It can be done without the need to spend the night in the hospital and fewer (approximately one to five) treatments are needed. The Bone Mets clinic provides patients with metastatic disease of the bones access to the Radiation Oncology Services at the Juravinski Cancer Centre. The primary goal of the clinic is to offer patients same day radiation therapy treatment for pain and symptom relief from metastatic lesions. Radiotherapy is a successful, time-efficient, well-tolerated, and cost-effective intervention that is crucial for the appropriate delivery of palliative oncology care. The clinic operates weekly with a team of Radiation Oncologists, Residents, Clinical Specialist Radiation Therapists, Nurses, as well as multidisciplinary support from the Pain and Symptom Management Team, Orthopedic Oncology and Clinical Trials. Most patients will receive a consultation and radiation therapy treatment within one week of referral. Patients may receive a single radiation therapy treatment or more as determined by the Radiation Oncologist and Health Care Team. The CyberKnife® is a system that delivers stereotacic radiosurgery. Juravinski Cancer Centre is the only CyberKnife® location in southern Ontario. The CyberKnife® is the world’s first and only robotic radiosurgery system designed to treat tumours in the body. The CyberKnife® uses a robotic arm that takes x-ray pictures to find the tumour and provides the highest level of treatment accuracy. While its name refers to surgery, the CyberKnife® does not involve cutting of tissue. It is a non-invasive radiation therapy treatment for cancerous and non-cancerous tumours. The CyberKnife® can be used to treat tumours in the body including the brain, spine, lung, breast, prostate, head and neck and other soft tissues. Breath Hold is just one of many radiation techniques and is not used for all patients. Your Radiation Oncologist will have a discussion with you and will determine if you will benefit from using Breath Hold. The following video provides information about a type of radiation treatment technique called Deep Inspiration Breath Hold to help you to practice and prepare for your radiation planning appointment. We have found that practice is very important to the success of this treatment. Please practice before coming to your appointment. Health outcomes improve when children begin treatment in a relaxed and positive state of mind, encouraged by play. The Pediatric Radiation Therapy program ensures families have a safe, welcoming and entertaining waiting area (the Pod) for children undergoing radiation treatment. We use a variety of toys, activities and rewards to encourage children to actively participate in their radiation treatment. For example, children may ride in a remote controlled vehicle to their appointment. We provide tablets or DVD players during treatment, bravery beads, music, and calendars to track their progress. This positive distraction is a powerful coping strategy for children. Our team includes pediatric radiation therapists, mould room technicians, dosimetrists, physicians, and staff at McMaster Children’s Hospital. Stereotactic Radiation Therapy can be given using the Cyberknife® system or a Linear Accelerator (Linac). How is stereotactic radiosurgery different from conventional external beam radiation therapy? This type of treatment is not recommended for everyone so you may want to discuss with you doctor if this is a treatment option for you. Hours of operation may differ depending on where your appointment is located in Radiation Therapy, but typically the hours of operation are Monday-Friday 8:00 a.m. – 6:00 p.m.